Today we are launching Try Azure Cosmos DB for free, an experience that allows anyone to play with Azure Cosmos DB, with no Azure sign-up required and at no charge, for a limited time. As many of you know, Azure Cosmos DB is the first globally distributed, massively scalable, multi-model database service. The service is designed to allow customers to elastically and horizontally scale both throughput and storage across any number of geographical regions. It also offers guaranteed <10 ms latencies at the 99th percentile, 99.99% high availability, and five well defined consistency models to developers to make precise tradeoffs between performance, availability and consistency of data. Azure Cosmos DB is also the first globally distributed database service in the market today to offer comprehensive Service Level Agreements (SLAs) for throughput, latency, availability, and consistency. Why did we launch Try Cosmos DB for free? It’s simple. We want to make it easy for developers to evaluate Azure Cosmos DB, build and test their app against Azure Cosmos DB, do a hands-on-lab, a tutorial, create a demo or perform unit testing without incurring any costs. Our goal is to enable any developer to easily experience Azure Cosmos DB and what it has to offer, become more comfortable with our database service and build the expertise with our stack at zero cost. 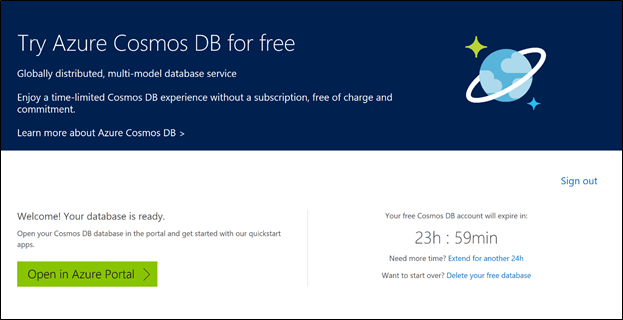 With Try Cosmos DB for free, you can go from nothing to a fully running planet-scale Azure Cosmos DB app in less than a minute. Try it out for yourself, it takes less than a minute. Or watch this quick video. 1. 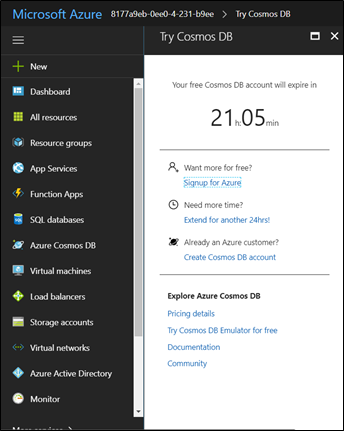 Go to Try Azure Cosmos DB for free page. 2. Pick the API/data model of your choice either SQL (DocumentDB), MongoDB, Table or Gremlin (Graph) API, and click Create. Note, you will need to login using a Microsoft Account (a.k.a. Live ID). 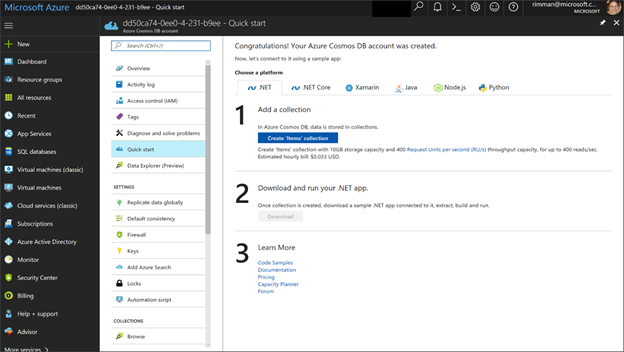 In seconds, you will have your newly created free Azure Cosmos DB account with an invite to open it in the Azure portal and try out our Quick Starts. 3. Click Open in Azure Portal, which will navigate the browser to the newly created free Azure Cosmos DB account with Quick Starts page open. 4. Follow the Quick Starts to get a running app connected to Azure Cosmos DB in under 30 seconds or proceed exploring the service on your own. When in the portal, you will be reminded how long you have before your account expires. 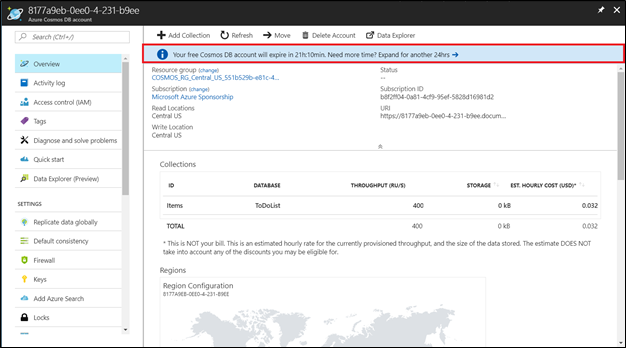 The trial period is 7 days, but you can extend it for another 24 hours, or click on the link to sign up for a Free Trial (if you are new to Azure) or create a new Azure Cosmos DB account if you already have a subscription. 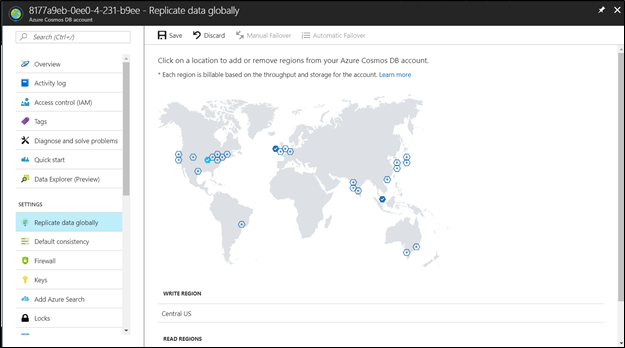 With Try Azure Cosmos DB for free, you can create a container (a collection of documents, a table, or a graph) and globally-distribute it to up to 3 regions, and use any of the capabilities Azure Cosmos DB provides for 24 hours. Once the trial expires, you can always come back and create it all over again. Azure Cosmos DB is the database of the future - it is what we believe is the next big thing in the world of massively scalable databases! It makes your data available close to where your users are, worldwide. It is a globally distributed, multi-model database service for building planet scale apps with ease using the API and data model of your choice. You never know it until YOU TRY IT! If you need any help or have questions or feedback, please reach out to us on the developer forums on Stack Overflow. Stay up-to-date on the latest Azure Cosmos DB news and features by following us on Twitter #CosmosDB, @AzureCosmosDB.